Formal portrait photographs of scientists tend to preserve the stiffness of the moment, rather than capture the sitter’s personality. Perhaps that is the reason that candid photographs of celebrities like Albert Einstein stick in public memory. Whether on a dorm room poster or a t-shirt, the iconic image of Einstein wheeling around on a bicycle makes a viewer smile--and makes him seem more human. Watson Davis captured just such an informal moment on film, when two Nobel laureate physicists, Hendrik Antoon Lorentz (1853-1928) and Albert Einstein (1879-1955), took a break during a July 19, 1926, meeting of the League of Nations’ Committee on Intellectual Cooperation. When several Nobel laureates are posed in public, as at a conference, the message conveyed is rarely relaxed. 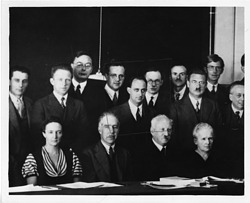 A superb example in the Science Service records is a group photo made at the 1933 Solvay conference in Brussels (see photo below). Around the table are such luminaries as Marie Curie and her daughter Iréne Joliot-Curie, Niels Bohr, Werner Heisenberg, and Enrico Fermi. The discussion before and after the shutter clicked must surely have been lively, but the photograph conveys only uncomfortable frigid formality. Einstein arrived in Pasadena in January 1931, and stayed about three months. Among the photographs taken at the California Institute of Technology in February 1931 were many showing three famous Nobel laureates, standing in a row. Albert Abraham Michelson (1852-1931) of the University of Chicago had received the Nobel Prize for Physics in 1907. Einstein had received the same award in 1921. Robert Andrews Millikan (1868-1953), Director of the Norman Bridge Laboratory of Physics at California Institute of Technology, had received the physics prize in 1923. Most of the photographs taken in front of the Athenaeum on that day project a dignified solemnity. But here, the mood is different. 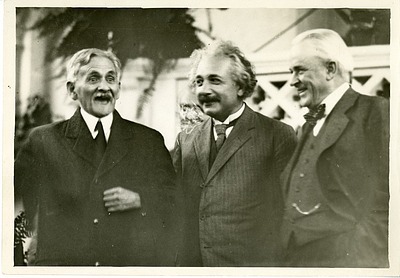 Seventy-nine-year-old Michelson seems the most lively, but Einstein and Millikan are also smiling. Had Michelson cracked a joke? Or had Einstein or Millikan? We may never know who said what, or to whom, but, thanks to the Smithsonian Institution Archives’ digitization program, we can all share in the moment.